What’s on your Ref’s Door? 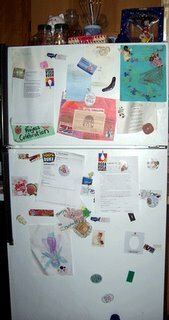 Toni at wifely steps asked, what does your refrigerator door look like? This is our two refrigerators, otherwise known as command central. It just so happened that we were going to do some spring cleaning today as things have gotten quite out of hand with our junk all over the place. As you can see, what’s on our ref is what is going on in our life. We put up upcoming events so we don’t forget, we put up pizza coupons so we don’t forget to use them next time we have one delivered, and of course, art work. We thought we would take a photo of this mess for posterity before we clean it up. Don’t worry though, it won’t stay pristine for long. In a few weeks it will be back to this much utilized look once again. So we ask you, what’s on your fridge? Post your photo and make sure you let Toni know about it. Loved the ref door project. I had to contribute a post on that one. Every time I think about my “lost space” (when the old fridge went), I get a tad teary-eyed. 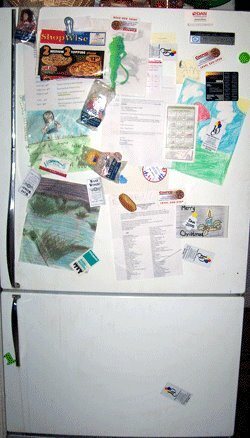 I’m still at a loss on what/how to organize my “STUFF” without my fridge door. I saw an ad the other day for a new POST-IT photo-paper and its giving me ideas 🙂 he.he.he.